Many consultants, coaches and small firms struggle to build a truly lucrative and fulfilling enterprise because they lack the right strategic plan and roadmap for maximising business revenue. This article discusses the limiting factors and offers a solution for growing your reach and maximising revenue. Most professional service providers are using very traditional methods to win new business and limit themselves to local clientele and delivery of face-to-face, one-to-one and done-for-you services. The top reason they fail to grow is because they don’t know how to attract and nurture good quality business leads to whom they can sell not only their professional services but also a range of products and programmes based on the expertise they offer. Growing a consulting or coaching business is not all about marketing to get more customers. Most importantly, it’s about maximising business revenue by increasing your sales opportunities (so you cover more white space under the graph shown above). 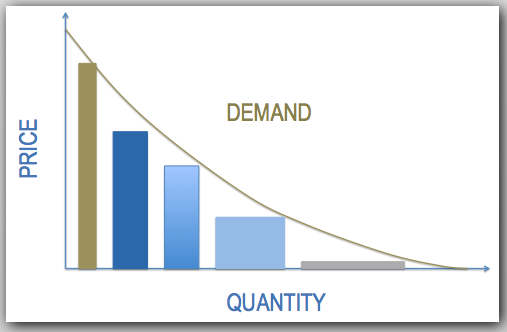 Leveraged consulting means scaling your business beyond the limitations of local clientele and billable hours (which would represent just one column on the graph). Your high-end consulting or coaching services should be the ultimate offer, but not your only offer. When you think about marketing and delivering your expertise online, a global marketplace opens up of people hungry for your help. Massive growth in digital publishing and online learning are driving many consultants and coaches to become “educational entrepreneurs”. The reason that educational content is such an important element of maximising business revenue for consultants and coaches is that it both generally fits your professional values as a for helping people and it engenders the trust and service needed to acquire a client. Success stems from creating good educational content that serves a clear and urgent need. Such content needs to be: (1) it is highly targeted to a specific problem that a specific group of people have; and (2) it’s highly valuable in that it helps them solve it. To start off, you could create a low-cost product that lots of people want and need or you could create a high-end programme that serves a niche market. Choose one area of expertise you want to become well known for doing well, create a signature product around it and focus your marketing predominantly on that. While your networking and advertising may generate leads, both tend to be expensive and don’t necessarily yield high-quality prospects for your business. On the other hand, driving lead generation through education-rich content marketing with highly targeted keywords can drive your ‘front-end’ marketing and generate solid leads with zero or very low cost, but does takes time and consistent effort. The way to uplevel your capacity for maximising business revenue is by creating a digital platform to generate leads and follow up with them on autopilot. Networking and advertising are continuous operational costs to your business month after month, whereas with a good automated follow-up system, content marketing can produce a continuous stream of leads long after the initial material is produced and published. However, most websites are not targeting their ideal clientele and they do not provide a good client experience. There’s little point working tirelessly to generate leads if they slip through the gaps of your marketing and sales process. Your follow up should take your prospect by the hand, provide value and help them know what to do next. It should be aimed at attracting and building trust with your ideal audience as they move through your sales “pipeline”. Once you have generated a lead, educational products and programmes offered on the ‘back-end’ enable your prospect to continue the relationship and achieve the results they want, whilst generating additional streams of income for you. This dual strategy works like a funnel – your prospect enters at the top end and you make sales at the bottom end. This is the epitome of the educational entrepreneur and enables you to switch to a highly leveraged business model and a path to increased influence, impact and income. Getting this strategy working comes down to how successfully you align your brand positioning with the needs of your target market, and how well you can systematise your expert process to scale both marketing and delivery. Leveraged Consulting is a new book that shows you a 7-step strategy and practical process for improving the capacity of your business brand, marketing and offerings. When you implement this approach you can attract more of your ideal clients, generate multiple streams of revenue and impact more people than one-to-one-consulting alone can achieve. Download a free sample chapter to learn more about maximising business revenue from your consulting and coaching expertise.